In the lead for the research applied to its own products since its foundation, Gortani Srl is proud because it has received a contribution POR-FESR 2014-2020 delivered by the European Union through the Friuli Venezia Giulia region (intervention line1.2.a.1-DGR n. 1233/2017). The contribution amounts to an overall sum of € 70.160,41, entirely appointed to the research project presented with the title:“Innovation and optimization of the technological process of the stainless steel and duplex welding in the production of tanks and pressure tanks of big dimensions”. The project consists of several steps and lasts 18 months. 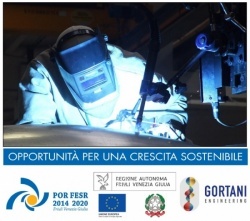 It has started on December 2017 and concerns the development of an innovative automated system for the TIG welding of the Gortani products, which are destined for the food, chemical and pharmaceutical market. The project aims at the study, experimentation and efficacy evaluation of an innovative technology of stainless steel welding in order to improve and optimize the company productive process as regards the reliability, productivity and cost-effectiveness. The innovation that we want to introduce is represented by the use of a new welding method of GTAW type (Gas Tungsten Arc Welding) with high performances. The improvement of the welding quality, the execution speed, the assurance of lack of defects: to sum up, these are the main goals which Gortani wants to achieve in order to guarantee to its customers an high quality product at a competitive price. The project’s activities are implemented by an internal research Team with a wide experience developed on the field and deepen theoretical/practical knowledge on the phases of the working process of the stainless steel. They are fundamental to implement all the setting activities of the new equipments, based on the productive requirements of Gortani. To this day, we have bought the main components of the welding system and as a consequence, it has begun the experimentation phase of the process with constant monitoring of the obtained results through a campaign of destructive and NDT on the welded joints.